There are 12 Assisted Living Facilities in the Beaufort area, with 3 in Beaufort and 9 nearby. The average cost of assisted living in Beaufort is $3,595 per month. This is higher than the national median of $3,346. Cheaper nearby regions include Port Royal with an average starting cost of $2,500. To help you with your search, browse the 59 reviews below for assisted living facilities in Beaufort. On average, consumers rate assisted living in Beaufort 3.8 out of 5 stars. Better rated regions include Port Royal with an average rating of 4.1 out of 5 stars. Caring.com has helped thousands of families find high-quality senior care. To speak with one of our Family Advisors about assisted living options and costs in Beaufort, call (855) 863-8283. Beaufort, South Carolina, is listed as one of the best places to retire in the U.S and was named the Best Small Southern Town by Southern Living. With close to 14,000 people, 18 percent of whom are 65 and older, Beaufort provides year-round golfing, historic landmarks to explore and a family-friendly atmosphere. Assisted living facilities in Beaufort and the state of South Carolina are referred to as Community Residential Care Facilities (CRCFs). They are licensed by the state Department of Health and Environmental Control, and they provide room and board and personal care to at least two residents. There are three facilities located within the city limits and nine in nearby cities like Bluffton, Hilton Head and Port Royal. The Beaufort Area Transit System (BATS) provides transportation for seniors and the general public. Trips include to and from nutritional sites for meals, medical appointments and for grocery shopping. The cost of the ride depends on the pickup location and drop-off point. Beaufort’s cost of living is 99.4, comparable to the U.S. average of 100. Seniors purchasing groceries and other necessities will find prices similar to other parts of the U.S. The overall rate of crime in Beaufort is much higher than the national average. Seniors have a 1 in 18 percent chance of becoming a victim of any type of crime and may want to use caution when traveling in the city. Retired persons under the age of 65 in Beaufort and in the state of South Carolina can deduct $3,000 in retirement income from their state income tax bill. Those 65 and older can deduct $10,000 per person. Social Security Income is not taxed, which may leave more money at the end of the year. The Beaufort area is home to world-class medical facilities, including the Beaufort Memorial Hospital, in the event of medical emergencies or illness. Summers in Beaufort are extremely hot and humid with average July highs in the low 90s. Because the humidity can make it feel hotter than it is, seniors with respiratory illnesses may have trouble being outdoors during the summer months. Assisted Living costs in Beaufort start around $3,595 per month on average, while the nationwide average cost of assisted living is $4,000 per month, according to the latest figures from Genworth’s Cost of Care Survey. It’s important to note that assisted living rates in Beaufort and the surrounding suburbs can vary widely based on factors such as location, the level of care needed, apartment size and the types of amenities offered at each community. 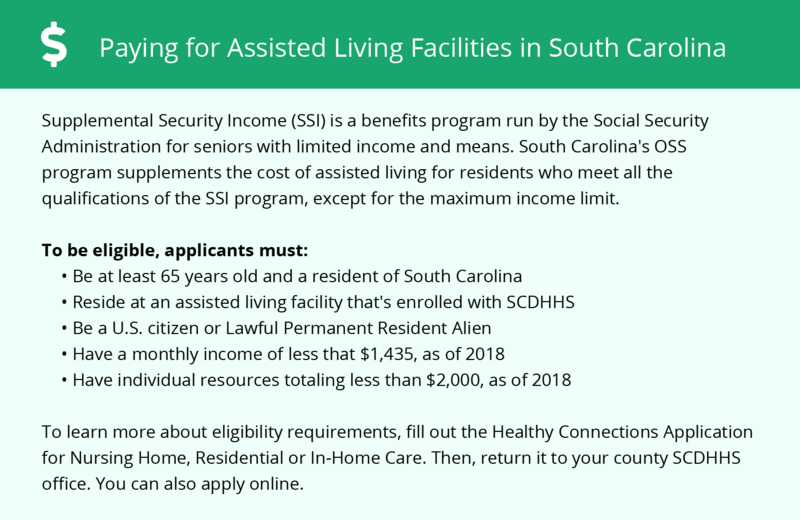 Public financing is available for seniors in assisted living facilities in Beaufort and the state of South Carolina under the Medicaid State Plan. 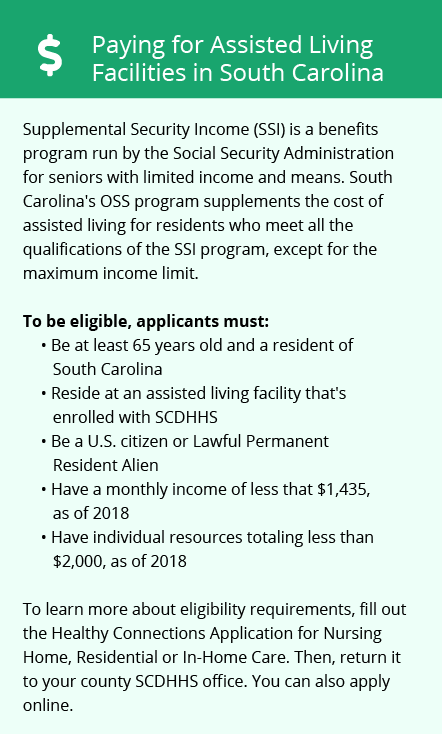 To be eligible, seniors must meet all requirements for Medicaid and must receive the optional state supplement (OSS) to the federal Supplement Security Income (SSI) program. The program provides limits on room and board charges for those eligible. Beaufort and the surrounding area are home to numerous government agencies and non-profit organizations offering help for seniors searching for or currently residing in an assisted living community. These organizations can also provide assistance in a number of other eldercare services such as geriatric care management, elder law advice, estate planning, finding home care and health and wellness programs. To see a list of free assisted living resources in Beaufort, please visit our Assisted Living in South Carolina page. Beaufort-area assisted living communities must adhere to the comprehensive set of state laws and regulations that all assisted living communities in South Carolina are required to follow. Visit our Assisted Living in South Carolina page for more information about these laws.